Today I am taking part in the annual Board of Trustees Retreat. As a member of the Senior Administration Team, I am not a member of the board, but I need to work closely with them to support the school Director in his work, and the smooth functioning of the school. I am required to attend the Board Retreat and the open meetings of the Board. Several times a year as well, I make presentations to the Board. In June of every year, I present the student learning data (IB scores, MAP, etc.). I’ve also presented on the student laptop computer program, our foreign language offerings, teacher evaluation program, EAL program, etc. I also sat on the Board Policy and Governance Committee three years ago. Today I am focusing on documenting my understanding of Board Governance. In this blog post, I will be featuring the key points on a functioning board. In the photo above, outside consultant, Ms. Adele Hodgson, is facilitating the retreat day. Ms. Hodgson works as a consultant with over 100 schools. This is a great way to start the year for the board. The purpose of the retreat is to help the board members understand their roles, and set the year’s goal for the Board, focusing on the strategic plan and our Mission and Vision statements. We use the National Association of Independent Schools (NAIS) International Trustee Handbook: A Guide to Effective Governance for Independent School Boards.” The other key documents for the day are the ISB Strategic Plan and Climate Surveys. Adele pointed out the state of international schools in the world. There are 6,037 international schools, with over 3 million students and close to 300,000 teachers in 236 countries. The market is worth 18.5 billion pounds which is growing 5-10% per year. Recent growth is from for profit schools, especially in Asia and the Middle East. Adele highlighted that international schools are leading the way in student-centered education. Companies appreciate the “products” of international schools: Young people who are independent thinkers, good managers of information, team players, and digitally literate. Adele recommended the work of Meredith Belbin. He has written much about board management and teams. Board members need to be cheerleaders of the school. They are not a conduit for complaints. Adele went over the board’s agenda, the one area where schools struggle is risk assessment and risk management. She also pointed out having benchmarks with schools that are similar to our school. This could be dealing with salaries and benefits, programs offered, tuition, etc. There should be two evaluations, one in December (1/2 year) and one in May. The first evaluation would be informal and the second formal. It is good practice to have the Business Manager of the school give a presentation on the budget to the BoT for the first meeting every year. 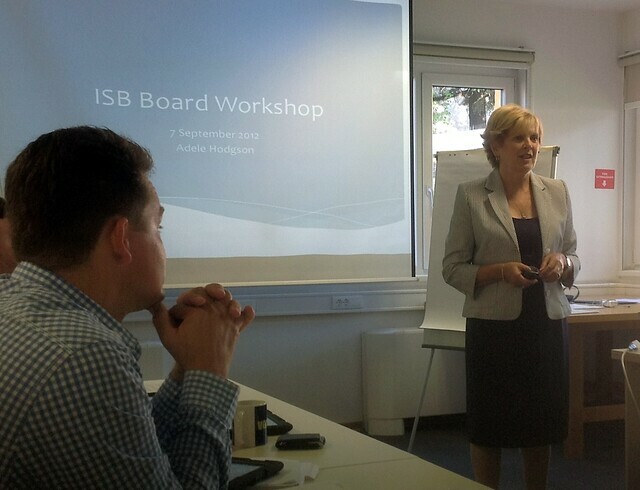 There were much other topics discussed and much about the specific context of the International School of Belgrade. These are not included in this public blog post. My big take-away is Board of Trustees training cannot be skipped for a successful school year. Excellent presentation of trustees annual retreat. Retreat always helps to provide the strategy planning and team building. I really impressed with this blog that is really informative and well managed. Thanks for share.